TROY, OH (October 11,2017) — Innovative outdoors gear manufacturer SmithFly Designs has launched it’s latest product, the Shoal Tent. The Shoal Tent, is a first of it’s kind inflatable raft with a tent on top, allowing users to camp right on their favorite piece of water. Since it involves no rigid structure using inflatable technology, the tent is very easy to set up and take down wherever you go. Usuers simply pump it up with the included pump and float it out to their favorite spot for an incredible night, sleeping right on the water. 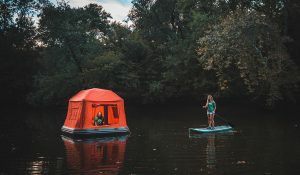 The unique floating design opens up opportunities for campgrounds and canoe liveries to even rent out these unique floating shelters on a nightly basis. SmithFly has already partnered with their own local canoe livery, Adventures on the Great Miami, to rent them out on the river through Airbnb. Beyond the purely recreational aspects of the Shoal Tent, there is also interest in using them to provide temporary shelters during extreme flooding events like those experienced recently after hurricanes Harvey and Irma made landfall in the USA this year. With climate change creating more frequent and extreme flooding events, local emergency management authorities could easily keep an inventory of Shoal Tents on hand to temporarily house the displaced victims without relocating the victims to large-scale storm shelters. SmithFly is currently taking pre-orders for our first production run of Shoal Tents, with the expected delivery date of January 2018. Since launching SmithFly in 2010, the small but growing brand has won awards and high praise for a creative approach to modular fly fishing gear, including Best New Angling Product from Gray’s Sporting Journal in 2013. Since then SmithFly has grown beyond soft goods and apparel to include a line successful ultra-light inflatable rafts and paddle boards. To learn more, visit www.smithfly.net.